Pamela Z: Baggage Allowance :: May 20-22, 2010; 8:00 pm + May 23; 3:00 pm :: z space @ THEATER ARTAUD, 450 Alabama Street, San Francisco, CA. 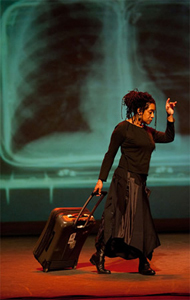 In this sonically and visually layered multi-media performance work, Pamela Z explores baggage in all its literal and metaphorical permutations. Through performance with voice, electronics, interactive video, and sculptural objects, Baggage Allowance scans and inventories the belongings (and memories) we all cart around examining baggage as both impediment and treasure. Drawing from Ms. Z’s extensive traveling and cartage experiences, text from found sources, and interviews with travelers who speak poetically about their memories of flying, train travel, and their numerous baggage-related stories, the work will features episodes that touch upon the ball-and-chain-ness of dragging one’s things all over the world.